The first few verses of Genesis 6 have been a mystery to many, and a hot topic for debate. Some would say they are “the most problematic in the whole of Genesis” (Gordon J. Wenham). Who are the sons of God and the daughters of men? What are the Nephilim? Are these verses a preface to the flood, or do they serve an entirely different purpose? Is this simply a story of how humanity was fruitful and increased in number, as God commanded in Gen. 1:28? Sadly, as much as I wish I had the answers to these questions, I don’t. But, I’ve had the opportunity to learn a bit more about what others have said, and will share a bit of what I’ve learned. We have yet to look at the Nephilim. What/who are the Nephilim? The Nephilim refer to “the heroes of old, men of renown” or “people…of great size” (Nu. 13:32). They may be the children of the sons of God and the daughters of men. Perhaps it just referred to a certain line of descendants who were very tall (e.g. like the Dutch!). Maybe they even refer to a different species altogether (such as neanderthals). We simply don’t have the resources to know at this point. And so, we’re left with questions. I’m reminded of Gen. 32, where Jacob wrestles with the angel of God from sunset to daybreak. 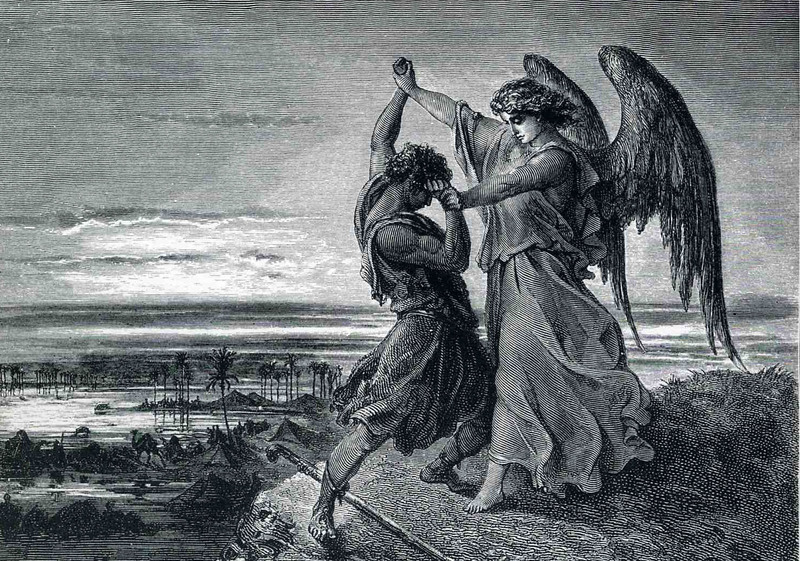 In the end, Jacob was not able to overcome the angel, but he was still blessed. We may not have the answers. But, we have wrestled with the text, and I believe we will be blessed through it. What are some interpretations you have heard of Gen. 6:1-4? Do you have any insights yourself? I have too. I’m very thankful that I have had professors in the past who have tried to wrestle with this text, even if they didn’t come to a firm conclusion. It taught me that it’s okay if we don’t always have all the answers. God can still speak through it. I love what Dr. Boogaart had to say about angels. But passages like this, and Psalm 82, bothered me even more after I began to think about angels as manifestations of God’s love. If God’s love becomes a personal agent for God’s work in the world, what does it mean that even these creatures are susceptible to the world’s bend toward sin, and contingent upon God’s grace. You reached the appropriate conclusion: the wrestling is what we are called to, and we are blessed in the struggle. Thanks for this! I’m glad you have had the opportunity to wrestle with some of these texts. I think you have some good questions. I hope you continue to be blessed through the struggle. I’ve always appreciated texts like Genesis 6 because it opens up our imagination to the world of ancient Israel. We hear about “heroes of old” – mythic people who did mythical things. In our modern conception of reality, we have done away with these mythical beings and texts, usually out of fear or distrust. But the Old Testament invites us into a strange (to us) world where Adonai interacts the children of Israel. I also appreciated your contentedness in not having any answers. In my studies, sometimes the question provides more avenues for learning than a simple answer. Thanks for posting, Rev. Shaffer. Thanks Zac! Glad you appreciated it.